Spending the day in Terre de Haute, a French island in the Caribbean never visited by big ships, I was reminded of the obvious: The tall sailing ships of Star Clippers go where big ships can not. But more than the small size of their ships and that they are powered by wind for the most part, there are other features that we discovered on a Windward Islands sailing of Royal Clipper. We had stateroom 208, an Oceanview cabin with two porthole windows that was laid out quite nicely. 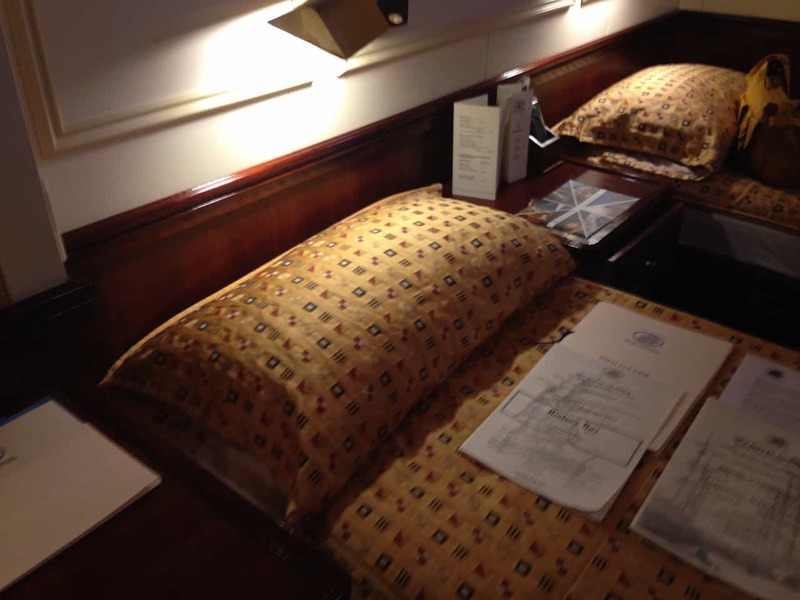 Two twin beds that could be converted to a double like most other cruise lines are standard. Under-bed storage took our biggest pieces of luggage and a built in storage drawer was a nice addition. Cabin lighting options provided a number of different possibilities ranging from full light to sectional lighting appropriate for working at the built in desk, illuminating a curtained changing area only and more. One closet with hangars was about half what many other lines offer but with hangers mounted high, additional storage below made up for it. The star of the show in cabin appointments though is the marble-floored bathroom which is a generous size with adequate storage behind a triple pane mirror and under the sink. At the Purser’s Desk/Sloop Shop onboard clothing and logo shop, DVD’s are available to borrow at no charge. Passengers can choose from hundreds of titles but I can’t for the life of me see why someone would want to watch television on this ship. Cabins have TV’s and a DVD player but we turned on CNN once and it was such a bad fit for the ambience of Royal Clipper that we turned it off rather quickly. These are sailing ships with sailors that man the decks as the captain calls out commands. They make quite a show of it too, playing grand orchestral compositions of seagoing music as the ship’s sails are set, every single time. Initially, I thought that would get old pretty fast. On the contrary, as the voyage proceeded and we learned more about sailing ships from the crew and well-traveled passengers we came to appreciate it more each time. As I write this we have two more sailaways left on our itinerary and I’d imagine that the last one will be quite difficult to bear. Never has the term “master of the vessel” had more meaning than on this ship. 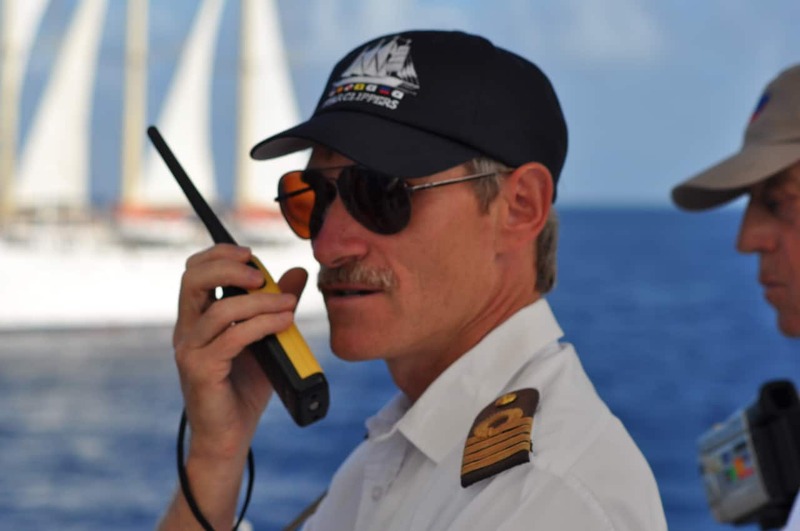 Frankly, I respected that position on other sailings and appreciated the tremendous weight of responsibility that rested on the Captain’s shoulders. 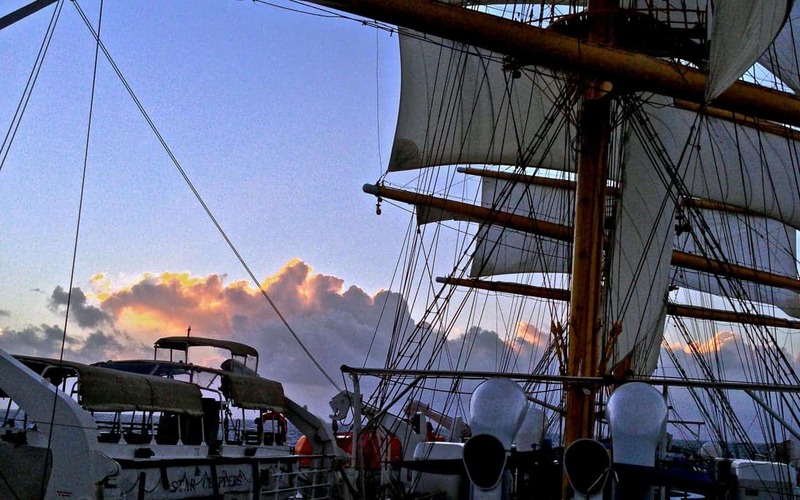 Still, on Royal Clipper we see navigation happening in many ways as it has for hundreds of years at sea. Sails are made of longer lasting material now and not canvass. Voyages take weeks rather than months. Modern technology supplements age-old sailing ways. But the Captain is an active, working part of the crew and is constantly present. One day we met up with another Star Clipper ship and a traditional salute had crew members on the Bow Sprit (pointy thing on the front) of both ships, displaying the flags of their home nations. Another day passengers boarded tender boats to see Royal Clipper with all sails deployed. The masterful seamen on board were able to do that and not outrun the tenders but place the ship in nearly a station-keeping position (to borrow a Star Trek term), one sail set for forward motion while another compensated with equal force in the opposite direction. After that event, when passengers were back on the ship, they were invited to take a photo of the crew, assembled as a group on deck. Captain Tunikov was quick to give credit to his crew, inviting passengers to get a photo of “the best sailing crew in the world,” a hearty approbation of which no passenger had any doubt. 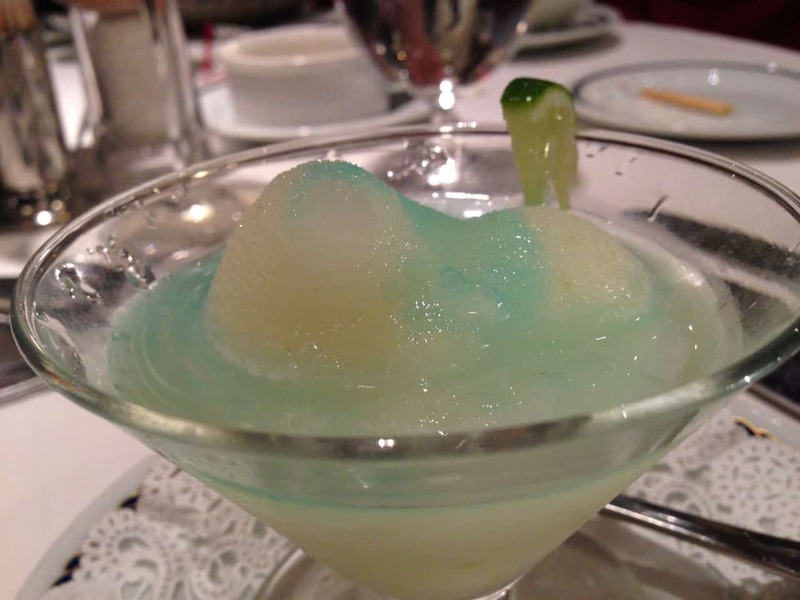 Sure, food is a big part of any cruise experience and it has evolved over time. Big ships have gone from “let me fill my gaping maw” buffets to healthy-choice options and a variety of onboard venues from which to choose. On Star Clippers, the attention to detail on culinary offerings is nearly beyond description. I say “nearly” because this is the topic of an upcoming post covering dining from A to Z and we will get into great detail there. But researching this cruise line and ship prior to boarding, we found very little information about dining. Few details, reviews, menus…nothing. Describing the culinary offerings on Royal Clipper one word stands out as quite appropriate: Fabulous. No, really fabulous and not in a gaudy, showy way. Let’s put it this way: I can’t remember the last time I had food so good on a cruise ship that I wanted and nearly did eat everything on the menu.